Sand Casting - Learn The Advantages & Disadvantages | Protocast Inc. The prototype casting industry is unique in the sense that there are a great number of different methodologies that can be used to create a finished product. That being said, we are always learning new things and seeking knowledge on new casting topics so that we can bring you, our customer, high-quality prototypes and products. In today’s blog, we will be discussing what sets sand casting apart from other methods of prototype casting, as well as the advantages and disadvantages that this casting methodology brings to the table. Sand casting is one of the most common forms of metal casting and accounts for a large majority of cast prototypes in weight. During the sand casting process, a metal is heated to the point that it melts and the chemical composition can be modified. Once the material becomes a liquid property, the molten metal is poured into a sand mold that has been shaped to the desired specifications of the prototype being manufactured. Like other forms of casting, the advantages and disadvantages of the casting type are semi-dependent on the knowledge that the designer has, as well as the care that they use to complete the process. Before any casting project is completed, it is important to carefully weigh the functional needs of the part that is to be cast, as well as how the particular casting method will help to achieve those results. Draft Angle – The draft angle is the angle that is applied to all vertical faces of the design to aid in removing the product from the sand mold cleanly and easily. This angle will be different from project to project, meaning that it is important to find an experienced foundry to sand cast your prototype. Parting Line – A parting line is exactly what it sounds like — a line that separates the draft angles that change direction. The parting line is an important consideration in sand casting because it can drastically affect the price of the cast. Undercuts and Cores – Undercuts are the part of the sand cast that prevents the design from being removed during the mold making stage. The use of loose core sand pieces can increase the cost and timeline of production — meaning that an early parting line should be used to prevent undercuts. Cross Sections – Also known as uniform wall thickness, cross sections are support sections for the cast that are usually preferred to be thicker, but they can be infeasible, as larger masses of molten material will take longer to cool and harden. Wall Thickness – Wall thickness is an important consideration in sand casting because an improper volume to surface area ratio can cause cavities and integral failures in the mold. Corners and Angles – Corners and angles are cooling characteristics of the sand cast that have a major influence on the quality of the finished prototype. Sharp angles can cause localized heat spots that can degrade the overall quality of the casted prototype. Junction Design – Junction design refers to the places where two different parts of the cast meet at an angle. There are five junction types (L, X, V, Y, & X-T) and they should be carefully placed to minimize the risk of shrinkage and tears in the cooling cast. Casting Allowances – Casting allowances is the size that metal will shrink when it is solidifying. Each material will shrink differently, so it is important to consider what metal is being used in the casting process before engineering the sand mold. Design Flexibility – Sand casting is excellent for prototypes and jobs that might require flexibility in both size and weight. The only size and weight restrictions are the amounts of materials available and the size of the foundry. Shape Complexity – Sand casting, while being flexible in both size and weight, is also flexible in the sense that it can be used to create prototypes of varying complexities. No other casting process allows for such a great number of complex shape components. Large Material Choice – Another benefit of sand casting is the ability to use a number of different casting materials. As long as the alloy can be melted, it can be used to create products with sand casting. 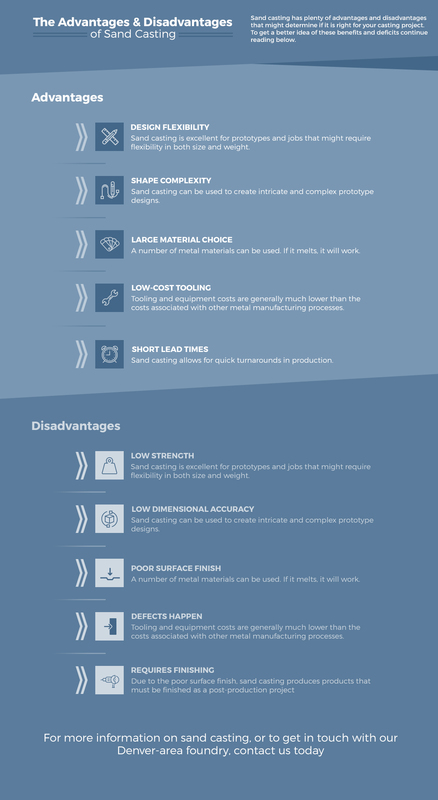 Low-Cost Tooling – Tooling and equipment costs are generally much lower than the costs associated with other metal manufacturing processes. This makes sand casting one of the cheapest methods. Short Lead Times – Sand casting allows for quick turnarounds in production — making it one of the fastest forms of casting. Low Strength – Because sand casting is not a machined part, it has a high porosity. Because of this, sand casting is best used for smaller, non-weight bearing, prototypes. Low Dimensional Accuracy – due to the nature of metals shrinking as they cool, the dimensional accuracy can fluctuate along the surfaces, with some parts of the cast being more accurate to form than others. Poor Surface Finish – Sand casting is not the best casting process to use if you are looking to create a prototype with a machined look. The surface texture of the sand leaves its texture on the hardened metal. Defects Happen – In sand casting, defects are simply unavoidable — it is as simple as that. Shrinkage, porosity, metal defects, and surface defects are all possible when sand casting. Requires Finishing – Due to the poor surface finish, sand casting produces products that must be finished as a post-production project. If you are looking for a foundry in the greater Denver area, look no further than Protocast Inc. Whether you are in need of sand casting services, machined parts, or part modification, our team of experienced foundry operators can provide you with the perfect casting solution for your project. Contact us today for more information. We look forward to working with you for all of your casting and machining needs. Learn More About Protocast Inc.